In Anna E Nekola and Tom Wagner Edited Congregational Music- Making and Community in a Mediated Age, Andrew Mall writes on the Annual Christian Music and Arts Festival, aka the Cornerstone Festival in the popular vocabulary, which was held in the month of July at rural Western Illinois, Chicago by Jesus People USA for almost thirty years until it stopped recently (1984-2012). His article highlights how the festival was ordered around certain shifting ideas about the boundaries of sacred and secular music largely framed by an ethic explained by Shawn David Young as the ‘emerging evangelical left’. Cornerstone Festival’s initiative had been to promote the otherwise repressed sound of the sub-cultural Christian Music. Today this sub-cultural sound has been enmeshed in the mainstream but definitely not the sub-cultural Christianity in its entirety. Due to the growing presence of social media, Cornerstone festival no longer remained the sole information repository about access and support artists and labels. The ‘imagined community’ built around the Cornerstone Festival’s physical, social and cultural spaces came to life for a brief time period every year until it was appropriated by the virtual world with adequate access to official and unofficial blogs, photographs, videos, concert reviews, etc. Why would I want to start a review of a burgeoning World Sacred Music festival, KETEVAN by drawing one’s attention to a Christian Music Festival that had a distinct rhetoric of functioning but was unable to sustain itself after a considerable period of contribution to the promotion of congregational music-making and community participation? This is just a way unsettling the premise that live music has its own public life. One cannot deny the growing presence of the social media. Today, the latter has ineluctably become an extension of the world of live music whereby, immediacy and recurrence must learn to co-exist successfully in order to create and hold on to the idea of a brand. This idea of formulating a brand became lucid from conversations with the Festival’s Artistic Director, Maestro Santiago Luserdi. This immediately brought my attention to think how a sacred music festival could evolve as a brand in itself enclosing the social as well as the musical implications. Wagner and Riches in their article on the Evolution of Hillsong Music: From Australian Pentecostal Congregation to Global Band in the Australian journal of Communication Vol. 39 (1) published in the year 2012 spoke about the stages of the emergence of the Hillsong brand. The contributions of the pastors and later the youth music band over the different phases distinctly lay out the idea of the Hillsong Brand. The first phase saw a constant cultural referencing with an Australian imagery whereby it could stand out as a local church replete with congregational songs useful for other churches as well. It was opposed to secular and rock music styles. The second phase saw musical experimentations and addressed a global audience and Darlene Zschech, a pastor became an icon. Phase three tapped the youth inclination towards a rock- pop sonic map and the theme of the album covers shifted from landscape photography to images of the performers. Phase four saw Hillsong Music as an established brand with its focus on the expanding its sonic map through its explorations of the British and Sacred sounds. Phase five locates the organizational or the Megachurch presence in its totality, and gives importance to the growing musical styles, lyrical interpretations as well as the theme of the cover art. If one looks at the poster and the tickets of the Ketevan World Sacred Music Festival, one will be able to attribute to it an explicit agenda of branding. There is ‘a little birdie told me’ logo, images of the young and renowned artistes in the area of sacred music across various musical traditions. The two weeks long festival also had a three day Symposium aiming to generate research ideas across Indian and Western music tradition and there were few master classes and social projects across different institutions. There was also the angelic outfit that the women in the university choir wore which was exclusively designed for the festival by Goan designer, Syne Coutinho. The best part about the festival were the venues chosen for the concert- churches in Old Goa especially the ruins of St. Augustine which was made available for public entertainment purposes for the first time. This makes it an exciting and a unique pursuit in Goa. What is left to be seen is how much of its enthusiasm and influence resonates with the community to make it a festival synonymous with the month of spring (February) in Goa over the years to come. The festival was named after the 16th century Georgian queen Ketevan. Tia Ghose in her article ‘Lost Remains of Martyred Georgian Queen Unearthed’ in Live Science provides some interesting facts. Queen Ketevan was held captive by the Persian ruler Shah Abbas I after killing her husband and conquering the territory. Due to her refusal to convert to Islam from Christianity and for not wanting to be part of his harem, Ketevan was put to torment and finally executed in 1624. After her death, the Georgian Orthodox Church declared her as a saint. According to an ancient Portuguese document her bones were smuggled out of the country by one of the Augustinian Friars she had befriended before her death. The bones were placed in a black tomb kept in the window of the St. Augustinian Convent in Goa, India. Santiago Luserdi Girelli, Western Music Professor, Anthony Gonsalves Chair, Goa University, conductor of the Seville Chamber Choir, Capella Dela Luce and the Goa University choir says that the Ketevan World Sacred Music is born to last. “The idea has been to create a brand of spiritual experience of beauty, goodness and truth where artists and audience can unite”. The idea of the festival emerged due to his many years of concerts, spiritual retreats and musical research centered around archives and teaching. Goa, he says, ‘is the perfect example of musical and spiritual co-existence of the East and the West. The beautiful landscape makes it all the more appropriate’. He has been part of a festival with a similar format in South America called the Baroque and Renaissance Music Festival during 2008-2010. The Social project of Ketevan saw many surprised village children who for the first time saw and touched the instruments. The symposium also managed to bring together scholars from different countries and discuss about their ongoing work and possibilities of research. Rudolf Ludwig, Executive Director of the Festival and Director of Art Chamber, Goa says that it wasn’t easy getting all the logistics in place. Arranging all the necessary funds was quite a challenge due to the absence of an Industrial infrastructure in Goa. 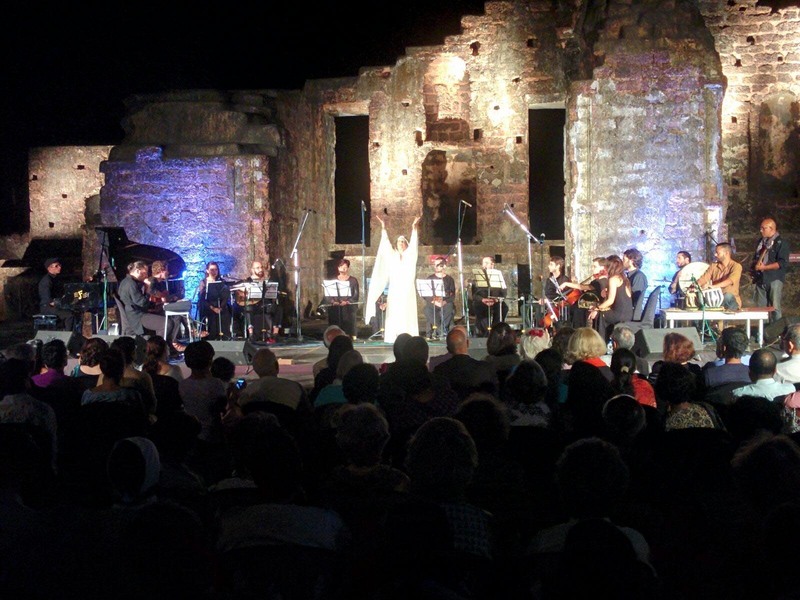 Be it bringing together 130 musicians and researchers in Goa or acquiring the permission to use the St. Augustine ruins for cultural and artistic events. Regarding access to the ruins, he says, “It took 12 months to get in there, and permission came 3 hours before the festival kicked off on Friday 12th Feb by 7 pm”. He also talks about the performativity- “I feel the biggest accomplishment is to bring Goan / Indian musicians to a level of professionalism, where we truly can say, “India is now on the map”. I wouldn’t hesitate to perform with the choir and the orchestra in a concert in Europe or America. This confidence was not there before. This fact was reflected by many of our foreign visitors.” When he was asked to tell us about the memorable aspects about the festival, he says that “Answering that question will be the benchmark whether Goa or India as a whole will accept high quality artistic events or would only stick to Bollywood. The result will either chase off certain people or invite them to this country, whether it wants to be part of the International community or play on its own”. Ignacio Monteverde, a Flamenco guitarist and Sound recorder based out of UK, spoke about how the informal jamming sessions with the musicians who had travelled from Spain and a Sitar player from Goa brought back the ‘oral’ element of Flamenco. He performed his own compositions but what made it easier for his Spanish friends to incorporate the fitting utterances and claps was their Andalucían music connection. He says ‘it is natural for them to clap. They have the rhythm already’. During his four month stay in Goa, he was also Santiago’s assistant in training the Goa university choir. His role involved working with the different voices and bringing the little nuances to the Maestros notice. He sang tenor with the choir although he can reach the bass notes if required. Recalling his earlier days of classical guitar, according to Ignacio, ‘both Flamenco and Classical Guitar have to thank each other. While Flamenco emphasizes a strict delicate rhythm, classical guitar gives importance to clean sound”. He also gave few master classes at the Kala Academy and says that his idea is to showcase and initiate both teachers and students to the style of playing flamenco guitar because the training at the Kala focuses solely on classical guitar. Slowly he will engage students to perform in ensembles and he intends doing month long workshops twice a year. Member of the Goa University Choir Chriselle Mendonca was performing with the Seville Choir for the second time. Her first time was in Spain and she really enjoyed both her performances. The pieces were difficult and had to be learnt in short period which led to excitement and nervousness. She says “singing for the concert was a lovely experience, especially in St Anthony’s church. What I liked about lux aterna was the harmonies and the melodies, especially the dissonances. The challenging part of my voice is the high notes we have to take and when we have to sing those high notes in piano… Also the semiquavers in the Bach were a challenging part for our voice”. For Utsav Lal, the concert pianist, Ketavan was an incredible experience. He says, “Everything from the line up for artists to the amazing venues chosen made it one of the most memorable festivals I’ve ever had the chance to attend. I think the most special thing about it was that there was a really great vibe amongst the artists and organizers and everything felt like it was being done at a very personal level. It didn’t feel like musicians came in to play their slot and went back to the hotel etc. There was a great cross-communication of ideas, new projects between all the musicians and artists and I think this is what makes a festival stand out. I was only there for two and a half days and now wish I had been able to attend the whole festival. It was also wonderful that most of the organizers Rudolf and Santiago and the rest of the team were not only interested in music but musicians themselves immersing themselves in every programme on offer. I hope to see this festival continue on and flourish for many years. I think the sold-out crowds for every performance speaks for how much of a success the festival was”. Rakesh Chaurasia, the flautist sums up his experiences beautifully. “It has been a great experience for me as I have never came across of so many genres in the same festival also I loved the amazing venues chosen. I would like to thank Mr Santiago and Mr Rudolf for coming up with such an amazing idea, at the end I would also like to thank the media and the people who supported this event and made it happening. Ohh! How can I forget the Goa audience who showed up in such a large number and was so receptive”. Pandit Debashish Bhattacharya, the slide Guitar maestro brought to light certain fascinating facts. “I think Ketevan festival was a great success in many ways. It aimed for the universal sacred musical unification. It was timed at the very moment when many of the popular western classical chamber orchestras are shutting down like Brooklyn Philharmonic orchestra because of financial crunch. Invitations extended to Indian classical music experts show the respect given to Indian old traditional music.” The nurturing of the local artistes alongside invited artists from various parts of the world gave it a dynamic approach according to him. The perspectives from few of the people who made Ketevan such a huge success in the first year is telling. Brainchild of the Artistic Director Santiago Luserdi Girelli and Executive director Rudolf Ludwig, the festival very clearly demonstrated the many ideas of sacred music through its varied repertoires, not just in terms of musical renditions but also in the context of lectures and social outreach. There was colonial sacred music from the archives of Cathedrals in Mexico, Guatemala, Bolivia and Peru composed by Portuguese, Spanish and Italian composers four centuries ago, Lux Aeterna by the 1943 born Amercian composer Morten Lauridsen brought in echoes of Gregorian chants alongside a merging of Medieval, Renaissance and contemporary sounds and the Bach concert carefully included selected arias and choruses of cantatas and passions of the great German composer. There were a few pieces from Requiem and Armed Man by the 1944 Welsh composer, Karl Jenkins which focused primarily on pain, destruction and peace. There was Jewish and Sephardic music, flamenco let us a peak into the gypsy culture and there was music from Indian classical traditions. All these brought out the multi-genre aspect of the festival whereby the idea was to actually make possible a dialogue across different musical traditions. Canadian Kathak dancer Joanna De Souza mesmerised the audience by enacting the life and journey of the 16th century Georgian queen Ketevan at the St Augustine Ruins at the start of the festival. Few of the Institutions like the Old Goa Music Society, Entertainment Society of Goa, Goa University, Archaeological Survey of India, and others, made the festival come alive. Musical dialogue is something that the Goans love. One can gauge this from the Monte Festival, to which they have been exposed to since the year 2003, where diverse cultural traditions vis a vis western and Indian Classical music traditions are presented at a lovely site, the courtyard of Capela da Nossa Senhora do Monte (Chapel of Our Lady of the Mount). The symposium held at the Central Library, Panjim, too brought forth the idea of music research pertaining to Sacred, traditional and Classical music in Goa and beyond. There was discussion about Goan Sacred Music, notions of Goan identity through engagement with Mando, an initiation into the formation of Konkani music, musical experimentations in lectures delivered at the Seminaries, reimagining Thomas Stephen’s Krista Purana in recent times. Then there was a historical journey into the world of orchestras in Bombay, explanations about making of repertoires in Jewish and Sephardic Music traditions, talk on ‘Pakhawaaj’ and its relation to sacred music in India. The idea of syncretism in musical traditions was also floated. Finally, the social projects where few of the artists went to village schools really touched the lives of the children even though momentarily. Many amongst them saw instruments like the Violin, Viola and Cello for the first time. It was a world of wonder and excitement for them. Being a participant in terms of singing with the Goa University Choir, presenting a part of my ongoing PhD work at the symposium alongside my involvement with the festival, like many others in the Choir, in the process of its planning and execution made me reflect on each of the aspects really closely. Yes! Everything wasn’t always smooth especially when it came to managing with limited infrastructure but our enthusiastic volunteers Grieg Fernandes, John Dias and Jocel Souza and the Office team comprising Katherine Hulit and Issac Fernandes made sure that the things fell into place. Ketevan is a new festival. Being a first timer, it has clearly wooed the audience with its variety, theme and venues. And I say bring it on 2017! We are waiting.